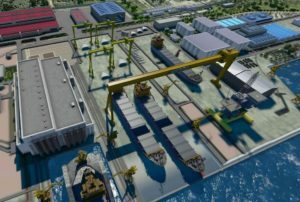 The Chinese CITIC Merchants explore possibility for construction of shipyard and dock near Vladivostok. The president of CITIC Merchants Eric Bin Huang met with Deputy Prime Minister of the Russian Federation Yuri Trutnev in Hong Kong, where were discussed the further options for Chinese investments. The construction of shipyard and dock near Vladivostok is joint project of China Shipbuilding Corporation and Rosneft and being part from the strategy of the country to improve domestic shipbuilding sector by renovation of the fleet. “We are mobilizing Chinese builders for the construction of the shipyard and dock near Vladivostok. This is a project of China State Shipbuilding Corporation and the company Rosneft”, said the president of CITIC Merchants, Eric Bin Huang. According to the Russian Maritime Register of Shipping in 2016 the country’s shipbuilders will deliver 90 new merchant ships, while the volume of orders scheduled for delivery in 2017 is less than 20. The world shipbuilding is in crisis during the last year, due to downturn in offshore sector, as well as overcapacity in bulk and container shipping markets. According to report of South Korean shipbuilders, the total value of orders for the year decreased by 63% yoy.